General Characteristics: Medium in height, well spreading, maturing within 9 to 12 months, producing from 5 to 10 oha; characterized by its light green petioles with pinkish base. Petiole: 60 to 85 cm. long, slender, drooping, light green, indistinctly whitish-green at edge, a pink ring at base with lighter pink for 3 to 5 cm. above. Leaf blade: 40 to 55 cm. long, 30 to 45 cm. wide, 30 to 45 cm. from tip to base of sinus, narrowly ovate, thin in texture, medium green; piko whitish; veins conspicuous, light green; lobes acute with shallow, wide sinus. Corm: Flesh white with light pinkish tinge, especially near apex, the fibers yellow; skin pale pink. 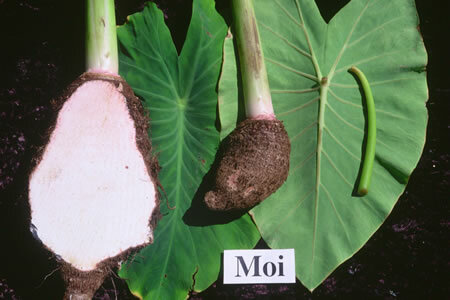 Origin, and derivation of name: Native variety; probably named after the whitish Hawaiian fish, moi. Distribution: At the present time this variety is one of the lesser-known taros but it is quite popular in certain districts, especially on Maui, Molokai, and in Puna, Hawaii; grown principally under upland culture but also does well under wetland culture. Use: Good poi and table taro.